Elizabethan theatre history is fascinating. How plays were first produced in the yards of inns - the Inn-yards. The very first theatre and the development of the amphitheatre! The Elizabethan Entrepreneurs ( the men with the ideas and the money!). The building, design and construction of the Globe. The builders! The location! 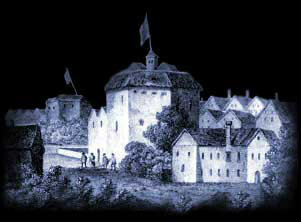 The plays, the playwrights, the politics and the propaganda all play an important part in Elizabethan theatre history. The great success of the theatre and the part that the Puritans played in its downfall - the ups and downs of Elizabethan theatre history. The history of the Elizabethan Theatre is a short and turbulent one. The success and popularity shown by Elizabethan theatre history during the life of William Shakespeare is an outstanding success story for the theatrical entrepreneurs of the era. The Elizabethan period saw the rise in the popularity of theatres and during this time the staging of plays moved from renovated inn-yards to the building of huge out door amphitheatres, such as the Globe, which were used for the summer seasons and the building or renovation of indoor theatres, used in the Winter seasons and by royalty, called Playhouses. The Elizabethan Theatre history started in 1576 and continued in England until the Protestants came to power. By 1648 Elizabethan theatres and playhouses were ordered to be pulled down, all actors to be seized and whipped, and anyone caught attending a play to be fined five shillings - but this was not the end of the Elizabethan theatre history! In 1576 James Burbage (father of the actor, Richard Burbage) started the Elizabethan theatre history by obtaining a lease and permission to build 'The Theatre' in Shoreditch, London.